On Nov. 13, 2018 PolitiFact's "PunditFact" brand issued a "Pants on Fire" rating to conservative Ken Blackwell for claiming Democrats and their allies were manufacturing voters in the Florida election recount. Broward's elections supervisor accidentally mixed more than a dozen rejected ballots with nearly 200 valid ones, a circumstance that is unlikely to help Brenda Snipes push back against Republican allegations of incompetence. The Times story says counting the 205 provisional ballots resulted in at least 20 illegal votes ending up in Broward County's vote totals. The Times published its story on Nov. 10, 2018. PolitiFact/PunditFact published its fact check on Nov. 13, 2018 (2:24 p.m. time stamp). The fact check contains no mention at all that Broward County included invalid votes in its vote totals. Instead, PolitiFact reporter John Kruzel gives us the breezy assurance that neither he nor the state found evidence supporting Blackwell's charge. Blackwell said, "Democrats and their allies (...) are manufacturing voters." We found no evidence, nor has the state, to support this claim. Blackwell provided no evidence to support his statement. In an article titled "PolitiFact is not biased--here's why" PolitiFact Editor Angie Drobnic Holan offers four points as evidence PolitiFact is not biased. This series deals with each of the four. 4. Reader support allows us to stay independent. Our independent journalism, seeking only to sort out the truth in American policy, is what motivates us to keep publishing for the benefit of our readers. We began over a decade ago as a politics project at Florida’s largest daily newspaper, the Tampa Bay Times. Today, we are a nonprofit newsroom that is part of the Poynter Institute, a school for journalists based in Florida. As with Holan's third point offered to show PolitiFact is not biased, her fourth point gives no reason to think PolitiFact is not biased. Does anybody need a list of partisan causes supported by public donations? Does anybody have the slightest doubt that PolitiFact's "Truth Squad" membership skews strongly left? If anyone harbors the second doubt we recommend checking out polls like this one that show moderates and conservatives place little trust in the media. If PolitiFact relies on donations primarily from liberals, then how does that make it more independent instead of less independent? Were PolitiFact to displease its liberal base it could expect its primary source of private donations to shrink. Here's something we'd like to see. And it's something that will never happen. Let PolitiFact poll its "Truth Squad" to find out how its ideology trends as a group. If conservatives and moderates are a distinct minority PolitiFact can use that information to bolster its membership outreach to those groups: "We need more support from conservatives who care about objective fact-checking!" And of course that will never happen. It tears down the facade PolitiFact built to suggest that its reliance on public support somehow keeps it politically neutral. PolitiFact has no interest in that kind of transparency. That kind of truth is not in PolitiFact's self-interest. We do not buy that PolitiFact sincerely tried to put forth a serious argument that it is unbiased. The argument Holan put forward toward that end was simply way too weak to make that easily believable. We think the main point was to soften misgivings people may have about joining PolitiFact's financial support club, which it has dubbed its "Truth Squad." We expect it (accusations of bias--ed.). Afterall [sic], as an independent group measuring accuracy, we are disrupting the agendas of partisans and political operatives across the ideological spectrum. We do it to give people the information they need to govern themselves in a democracy, and to uphold the tradition of a free and independent press. Still, we think it’s worth explaining our mission and methods, both to answer those who make the charge against us, and for our supporters when confronted by naysayers. Also see the trimmed screen capture image below (bottom) with an ad asking readers to support PolitiFact. If you ask us, PolitiFact's "Truth Squad" isn't worthy of the name if they buy Holan's argument. "Dupe Squad" would be more like it. Holan wants your money. And it looks like she's willing to put forward an argument she wouldn't buy herself to help keep that money flowing. Holan offers no real answer to those who claim PolitiFact is biased. To do that, Holan would need to specifically answer the arguments critics use to support their claims. PolitiFact finds it preferable to simply say it is unbiased without offering real evidence supporting its claim. And without rebutting the arguments of its detractors. Is the embedded ad asking for money a mere coincidence? We added the red border for emphasis. 3. We make mistakes sometimes, but we correct our errors promptly. The facts comes first with us. That’s why it’s important for us -- or any reputable news organization -- to correct mistakes promptly and clearly. We follow a published corrections policy than anyone can read. Readers also can easily access a list of fact-checks that have been corrected or updated after the original publication. I make mistakes sometimes, but I correct my errors promptly. Would that make me unbiased? Who believes that? A willingness to correct errors does not bear directly on the issue of bias. Consider PolitiFact's move of paying researchers to look for examples of biased language in its work (the study found no systematic evidence of biased language). Would a policy of correcting mistakes promptly cancel out a strong propensity to use biased language? Of course not. Correcting mistakes would only have an effect on biased language if the publisher viewed biased language as a mistake and corrected it as such. In our experience PolitiFact often refuses to consider itself mistaken when it makes a real mistake. What good is a thorough and detailed corrections policy if the publishing entity can't recognize the true need for a correction? And doesn't it go without saying that the failure to recognize the need for a correction may serve as a strong indicator of bias? We believe it is one of the most robust and detailed corrections policies in American fact-checking. We were momentarily tempted to fact check Holan's claim. Except she starts with "We believe" which immediately moves the claim into the realm of opinion. But if it were a claim of fact Holan could probably easily defend it because the claim doesn't really mean anything. Think about it. "One of the the most robust and detailed corrections policies in American fact-checking." Let's take a look at the set of American fact checkers, using the list of IFCN-verified fact-checkers. When we looked on Nov. 8, 2018 there were eight (including PolitiFact). With a pool that small PolitiFact could have the least robust and detailed corrections policy among the eight and plausibly say it has one of the most robust and detailed corrections policies in American fact-checking. Our opinion? In a pool of eight there's nothing to crow about unless you're No.1. Coming in No. 4 puts one in the middle of the pack, after all. We think PolitiFact's corrections policy is less robust than that of its parent organization, the Poynter Institute. We're wondering why that should be the case. The first two reasons Holan offered to support PolitiFact's "not biased" claim were incredibly weak. But the third item managed to register even lighter weight on the scale of evidence. A robust corrections policy is a poor protection against ideological bias. It's a bit like using a surgical mask for protection against mustard gas. 2. We follow the facts, not fact-check count formulas. We let the factual chips fall where they may. This is not bias; this is sticking to our mission of correcting falsehoods as we find them. As with PolitiFact's first supposed evidence, this one does not appear to work without assuming PolitiFact lacks bias. It's not biased to let the factual chips fall where they may if the evaluation of the facts was unbiased. But it's biased to let the factual chips fall where they may if the evaluation of the facts was biased. So far, this item offers us no solid reason for concluding PolitiFact lacks bias. Our Little League doesn't keep score! We don’t worry about who got the last False rating or how long since some group got a True rating. We look at each statement and each set of evidence separately and give it a rating that stands on its own. 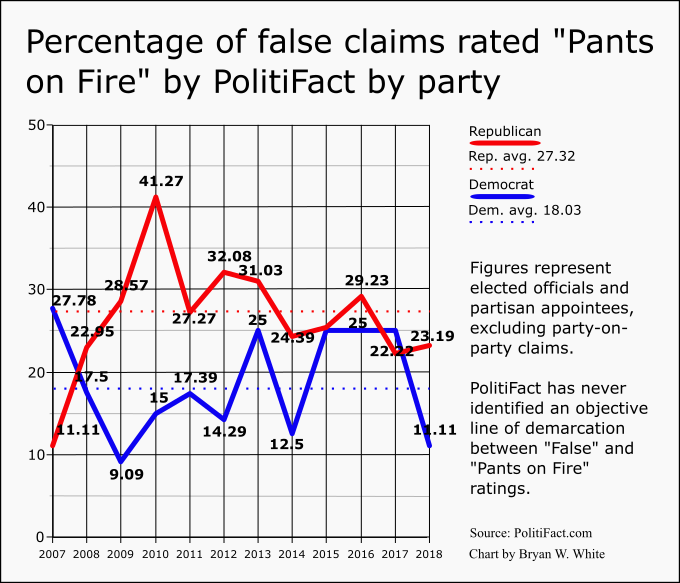 Concerning the first sentence, our data hint that PolitiFact does consider the proportion of "Pants on Fire" ratings it gives in relation to false ratings overall. Note the pattern under Holan (2014 onward) exhibits much more stability than PolitiFact's record under her predecessor, Bill Adair. Note that we started publishing our data midway through 2011. PolitiFact editors may have looked at the data in 2011 or later and acted on it, which may explain the reduced variation. Bringing the chart up to date as of today would bring the blue 11.11 percent for 2018 up to 20 percent. That's thanks to a "Pants on Fire" rating given to the North Dakota Democratic-Nonpartisan League Party (who?). Is there even a PolitiFact North Dakota? No. And the other "Pants on Fire" rating given to a Democrat this year went to Alexandria Ocasio-Cortez, who would have easily won her race in New York with 3,000 "Pants on Fire" ratings. Only once under Holan's tenure (omitting 2013, which she shared with Adair) has either party had a percentage outside the 20 percent to 30 percent range. Under Adair it happened seven times (again omitting 2013). Holan's assurances ring hollow because PolitiFact's Truth-O-Meter ratings get picked by a fairly consistent group of editors. They know the ratings they are giving even if they're not looking at a scoreboard, just like members of those Little League teams in leagues that avoid hurting feelings by not keeping score. On top of that, PolitiFact constantly encourages readers to view candidate "report cards" that show all the "Truth-O-Meter" ratings PolitiFact has meted out to a given candidate. Does this look like PolitiFact isn't keeping score? Even assuming Holan is right that PolitiFact does not keep score with its "Truth-O-Meter" ratings, that offers no assurance that PolitiFact lacks bias. Think of an umpire in one of those "no score" little league games. Would not keeping a tally of the number of runs scored prevent an umpire from calling a bigger strike zone for one team than the other? We don't see what would prevent it. Our database of fact-checks make it easy to see the ratings people or parties have received over the years. Our readers tell us they like seeing these summaries and find them easy to browse. But we are not driven by those numbers; they have no bearing on how we rate the next statement we choose to fact-check. So Holan is saying yeah, we keep score but we don't let it bias our decisions therefore we are not biased. It's circular reasoning again. Where's the evidence? How does Holan know PolitiFact does not let the score affect its work? What is PolitiFact's secret for exterminating normal human bias? Wouldn't we all like to know? We're not going to know from Holan's explanation, that's for sure. There's nothing in this section of Holan's article that offers any kind of legitimate assurance that PolitiFact filters bias from its work. In our story, we jabbed PolitiFact for publishing a page showing the "report cards" for some of the people it fact checks most often, asking our readers whether that page makes it look like PolitiFact doesn't keep score. Today, upon testing the link, it returned one of PolitiFact's 404 page not found errors. We don't know whether PolitiFact removed the page to make it look less like PolitiFact keeps score. But if the page was permanently removed (instead of being temporarily inaccessible) it's not a good look for Pulitzer Prize-winning PolitiFact. If PolitiFact removed the page, at least we've got an Internet Archive version for our readers. Our archived version is from Dec. 28, 2018. Remember when the Bush brothers negotiated NAFTA? 1. We fact-check inaccurate statements, not political parties. We are always on the lookout for bad information that needs correcting. We don’t have any concern about which party it comes from or who says it. If someone makes an inaccurate statement, it gets a negative rating on our Truth-O-Meter: Mostly False, False or Pants on Fire. If we at PolitiFact Bias were to come up with a story making an assertion, we would certainly try to produce some type of evidence giving palpable evidence in support. We find PolitiFact's article striking for its lack of evidence in support of the claim in the title. Let's assume for the sake of argument that it's true PolitiFact fact checks inaccurate statements and not political parties. We find both assertions questionable, but we can set that aside for the moment. What stops a biased fact checker allowing factors like confirmation bias to guide its selection of fact checks to reflect an ideological bias? This is an obvious objection to the first part of Holan's argument but her article completely fails to acknowledge it. 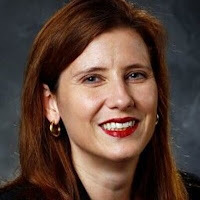 If Holan assumes that PolitiFact has no bias and therefore no confirmation bias can result then her argument begs the question (circular reasoning: PolitiFact is not biased because PolitiFact is not biased). If Holan isn't using circular reasoning then she's simply not addressing the issue in any relevant way. Fact-checking inaccurate statements and not political parties does nothing to show a lack of bias. In early 2011 Eric Ostermeier of the University of Minnesota did a study of PolitiFact's ratings. Ostermeier found Republicans were receiving worse treatment in PolitiFact's ratings. Ostermeier noted that PolitiFact's descriptions of its methodology offered no assurance at all that the skew in its ratings was unaffected by selection bias. In other words, was unrepresentative sampling responsible for making it appear that Republicans lie more? While developing our own research approaches to PolitiFact's ratings we came up with an observation we say strongly shows PolitiFact guilty of selection bias. Imagine PolitiFact used only its editorial judgment of whether a statement seemed so false that it was worthy of a fact check and was completely blind to political party and ideology. We say that regardless of whether one party lies more, the results should prove pretty close to proportional. If 40 percent of PolitiFact's ratings of Republicans come out "Pants on Fire" or "False" then the same should hold true of Democrats. If Republicans lie more that should end up reflected in the number of ratings, not in the proportions. PolitiFact as much as admitted to selection bias in the early days. PolitiFact founding editor Bill Adair said PolitiFact tried to do a roughly equal number of fact checks for Republicans and Democrats. That makes no less than two criteria for selecting a story, and one of them is not simply whether the statement appeared false. Trying to fact check Republicans and Democrats equally will skew the proportions (unless the parties lie equally and PolitiFact's sample is effectively random). 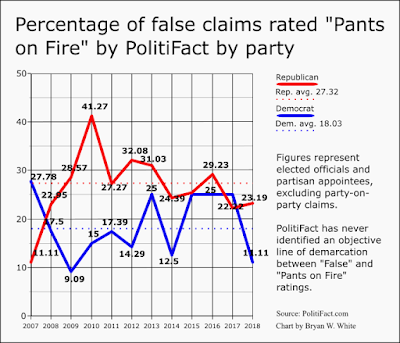 In Ostermeier's research, Republicans' statements were 39 percent "Pants on Fire" or "False" while Democrats' statements were 12 percent "Pants on Fire" or "False." That's strong evidence of selection bias. Note: We have not tracked these numbers through the present. Perhaps PolitiFact is closer to rating claims proportionally now than it was in Adair's time. If it is, then PolitiFact could present that as evidence it is blind to ideology when it chooses which claims to check. Until PolitiFact answers Eric Ostermeier's question it is unsafe to conclude that PolitiFact lacks bias. On Nov. 6, 2018, PolitiFact published an article declaring itself "not biased," suggesting with the tail end of the title ("here's why") that it could support the declaration with evidence. We welcome PolitiFact's better-late-than-never response to its critics. But we find the proffered reasoning incredibly weak. If the argument from PolitiFact Editor Angie Drobnic Holan addresses any item from our list of arguments helping show PolitiFact's leftward lean it does so obliquely at best. At the risk of using a pile driver to squash a gnat, we will address each of Holan's arguments in a series of posts. As we complete each part of the series we will add a hotlink to the corresponding list of arguments from Holan and PolitiFact. Just click a claim from PolitiFact to see our answers to Holan's arguments. We have completed adding links to articles debunking each of PolitiFact's supposed reasons supporting its claim of being unbiased. In summary, we think the purpose of Holan's article was not to put forward a serious argument. The article was ad copy designed to support an appeal for reader support. It was PolitiFlack. Item No. 4 emphasizes the point. When PolitiFact released the results of a language inventory it commissioned on itself, we were not surprised that the researchers found no clear evidence of biased language. PolitiFact's bias is mostly found in its choice of stories accompanied by bias in the execution of the fact checks. Use "Fear of immigration" and the language communicates a lean to the left. Something like "Inadequate border security" might communicate the opposite (no danger of that from PolitiFact!). Others from Holan's list of 10 election topics may also qualify as biased language. But this one is the most obvious. "Fear of immigration" is how liberals imagine conservatives reach the conclusion that securing the border and controlling immigration count as good policy. PolitiFact's claim to non-partisanship is a gloss. PolitiFact's Oct. 29, 2018 fact check of President Trump gave us yet another illustration of PolitiFact's inconsistent application of its principles. The same day as shooting at a Pittsburgh synagogue resulting in multiple deaths, Mr. Trump justified not canceling his campaign appearances by saying that terrorizing acts should not alter daily business. Trump used the New York Stock Exchange as his example, saying it opened the day after the Sept. 11, 2001 terrorist attacks. But it didn't open the next day. Trump was flatly wrong. Note that PolitiFact spins its description. PolitiFact says Trump claimed he did not cancel the political rally simply because the NYSE opened the day after Sept. 11. But the NYSE opening was simply an example of the justification Trump was using. Obama claimed his uncle helped liberate Auschwitz. But Obama's uncle was never particularly close to Auschwitz. That most famous of the concentration camps was located in Poland, not Germany, and was liberated by troops from the Soviet Union. One might well wonder how Obama received a "Mostly True" rating for a relatively outrageous claim. PolitiFact Framing to the Rescue! It was very simple for PolitiFact to rehabilitate Mr. Obama's claim about his uncle. The uncle was a real person, albeit an uncle in the broad sense, and he did serve with American troops who helped liberate a less-well-known concentration camp near Buchenwald, Germany. There's no question Obama misspoke when he said his uncle helped to liberate the concentration camp in Auschwitz. But even with this error in locations, Obama's statement was substantially correct in that he had an uncle — albeit a great uncle — who served with troops who helped to liberate the Ohrdruf concentration/work camp and saw, firsthand, the horrors of the Holocaust. We rate the statement Mostly True. There's no question Trump misspoke when he said the NYSE opened the day after Sept. 11. But even with his error about the timing, Trump was substantially correct that the NYSE opened as soon as it feasibly could following the Sept. 11 terrorist attacks. The NYSE opened the following week not far from where the twin towers collapsed. PolitiFact only used two sources on the reopening of the NYSE, and apparently none that provided the depth of the Wall Street Journal article we linked. Incredibly, PolitiFact also failed to link the articles it used. The New York Times story it used was available on the internet. Instead, the sources have notes that say "accessed via Nexis." All it takes to adjust the framing of these fact check stories is the want-to. Trump was off by a week. Obama was off by a country. Both had underlying points a fact checker could choose to emphasize. These fact checkers do not have objective standards for deciding how to frame fact checks. Related: "Lord knows the decision about a Truth-O-Meter rating is entirely subjective"
PolitiFact executed another of its superlative demonstrations of hypocrisy this month. After PolitiFact unpublished its botched fact check about Claire McCaskill and the affordability of private aircraft, it published a corrected (?) fact check changing the rating from "False" to "Half True." Why "Half True" instead of "True"? PolitiFact explained it gave the "Half True" rating because the (Republican) Senate Leadership Fund failed to provide adequate context (bold emphasis added). The Senate Leadership Fund says McCaskill "even said this about private planes, ‘that normal people can afford it.’"
She said those words, but the footage in the ad leaves out both the lead-in comment that prompted McCaskill’s remark and the laughter that followed it. The full footage makes it clear that McCaskill was wrapping up a policy-heavy debate with a private-aviation manager and with a riff using the airport manager’s words. In context, he was referring to "normal" users of private planes, as opposed to "normal" Americans more generally. Let's assume for the sake of argument that PolitiFact is exactly right (we don't buy it) in the way it recounts the problems with the missing context. Assuming the missing context in a case like this makes a statement "Half True," how in the world does PolitiFact allow itself to get away the shenanigan PolitiFact writer Jon Greenberg pulled in his article on Sen. Elizabeth Warren's DNA test? Trump once said she had as much Native American blood as he did, and he had none. At a July 5 rally in Montana, he challenged her to take a DNA test. "I will give you a million dollars to your favorite charity, paid for by Trump, if you take the test and it shows you're an Indian," Trump said. Trump now denies saying that, but in any event, Warren did get tested and the results did find Native American ancestry. Trump said those words, but Greenberg's version of the quote leaves out more than half of Trump's sentence, as well as comments that came before. The full quotation makes it clear that Trump's million dollar challenge was presented as a potential future event--a hypothetical, in other words. In context, Trump was referring to a potential future challenge for Warren to take a DNA test as opposed to making the $1 million challenge at that moment. PolitiFact takes Trump just as much, if not more, out of context as the Senate Leadership Fund did with McCaskill. How does that kind of boundless hypocrisy pass the sniff test? Are the people at PolitiFact that accustomed to their own stench? Washington Free Beacon: "PolitiFact Retracts Fact Check ..."
We were preparing to post about PolitiFact's crashed-and-burned fact check of the (Republican) Senate Leadership Fund's Claire McCaskill attack ad. But we noticed that Alex Griswold did a fine job of telling the story for the Washington Free Beacon. In the revised fact check published Wednesday, PolitiFact announced that "after publication, we received more complete video of the question-and-answer session between McCaskill and a constituent that showed she was in fact responding to a question about private planes, as well as a report describing the meeting … We apologize for the error." PolitiFact still only ruled the ad was "Half True," arguing that the Senate Leadership Fund "exaggerated" McCaskill's remarks by showing them in isolation. In full context, the fact checker wrote, McCaskill's remarks "seem to refer to ‘normal' users of private planes, not to ‘normal' Americans more generally." Griswold's article managed to hit many of the points we made about the PolitiFact story on Twitter. PolitiFact misleadingly claimed it was unpublishing the fact check based on "new evidence." New evidence to PolitiFact, maybe. The evidence was on the World Wide Web since 2017. The key error came not from missing evidence but from jumping to conclusions from the evidence it had. PolitiFact claimed it was "clear" from the short version of the town hall video that the discussion concerned commercial aviation in the broad sense, not private aircraft. Somehow that supposed clarity vanished with the appearance of a more complete video. Read the whole article at the Washington Free Beacon. We also used Twitter to slam PolitiFact for its policy of unpublishing when it notices a fact check has failed. Given that PolitiFact, as a matter of stated policy, archives the old fact check and embeds the URL in the new version of the fact check. No good reason appears to exist to delay availability of the archived version. It's as easy as updating the original URL for the bad fact check to redirect to the archive URL. In another failure of transparency, PolitiFact's archived/unpublished fact checks eliminate bylines and editing or research credits along with source lists and hotlinks. In short, the archived version of PolitiFact's fact checks loses a hefty amount of transparency on the way to the archive. PolitiFact can and should do better both with its fact-checking and its policies on transparency. Exit question: Has PolitiFact ever unpublished a fact check that was too easy on a conservative or too tough on a liberal? There's another potential bias measure waiting for evaluation. Sen.Elizabeth Warren (D-Mass.) provided mainstream fact checkers a great opportunity to show their true colors. Fact checkers from the PolitiFact and Snopes spun themselves into the ground trying to help Warren excuse her self-identification as a "Native American." Likely 2020 presidential candidate Warren has long been mocked from the right as "Fauxcahontas" based on her dubious claims of Native American minority status. Warren had her DNA tested and promoted the findings as some type of vindication of her claims. The fact checkers did their best to help. PolitiFact ran Warren's report past four experts and assured us the experts thought the report was legitimate. But the quotations from the experts don't tell us much. PolitiFact uses its own summaries of the experts' opinions for the statements that best support Warren. Are the paraphrases or summaries fair? Trust PolitiFact? It's another example showing why fact checkers ought to provide transcripts of their interactions with experts. Though the article bills itself as telling us what we can and cannot know from Warren's report, it takes a Mulligan on mentioning Warren's basic claim to minority status. Instead it emphasizes the trustworthiness of the finding of trace Native American inheritance. At least the article admits that the DNA evidence doesn't help show Warren is of Cherokee descent. There's that much to say in favor of it. At a July 5 rally in Montana, he challenged her to take a DNA test. Just minutes after PolitiFact published the above, it published a separate "In Context" article under this title: "In context: Donald Trump's $1 million offer to Elizabeth Warren." "I shouldn't tell you because I like to not give away secrets. But let's say I'm debating Pocahontas. I promise you I'll do this: I will take, you know those little kits they sell on television for two dollars? ‘Learn your heritage!’ … And in the middle of the debate, when she proclaims that she is of Indian heritage because her mother said she has high cheekbones — that is her only evidence, her mother said we have high cheekbones. We will take that little kit -- but we have to do it gently. Because we're in the #MeToo generation, so I have to be very gentle. And we will very gently take that kit, and slowly toss it, hoping it doesn't injure her arm, and we will say: ‘I will give you a million dollars to your favorite charity, paid for by Trump, if you take the test and it shows you're an Indian.’ And let’s see what she does. I have a feeling she will say no. But we’ll hold that for the debates. Note that very minor expansion of the first version of the Trump quotation torpedoes claims that Trump has already pledged $1 million hinging on Warren's DNA test results: "We will say." So PolitiFact's first story dutifully leaves it out and reinforces the false impression Trump's promise was not a hypothetical. Despite clear evidence that Trump was speaking of a hypothetical future situation, PolitiFact's second article sticks with a headline suggesting an existing pledge of $1 million--though it magnanimously allows at the end of the article that readers may draw their own conclusions. It's such a close call, apparently, that PolitiFact does not wish to weigh in either pro or con. Our call: The fact checkers liberal bloggers at PolitiFact contribute to the spread of misinformation. Though we think PolitiFact is the worst of the mainstream fact checkers, the liberal bloggers at Snopes outdid PolitiFact in terms of ineptitude this time. Snopes used an edited video to support its claim that it was "True" Trump pledged $1 million based on Warren's DNA test. Fact Check: Did Trump offer $1 million if Elizabeth Warren could show Native American heritage? The president denied making the offer, but video from a July 2018 speech seemingly demonstrates otherwise. The fact check coverage from PolitiFact and Snopes so far makes it look like Warren will be allowed to skate on a number of apparently false claims she made in the wake of her DNA test announcement. Which mainstream fact-checker is neutral enough to look at Warren's suggestion that she can legitimately cash in on Trump's supposed $1 million challenge? It's a good thing we have non-partisan fact checkers, right? The Washington Post Fact Checker, to our knowledge, has not produced any content directly relating to the Warren DNA test. That aside, Glenn Kessler has weighed in on Twitter. Some of Kessler's (re)tweets have underscored the worthlessness of the DNA test for identifying Warren as Cherokee. On the other hand, Kessler gave at least three retweets for stories suggesting Trump had already pledged $1 million based on the outcome of a Warren DNA test. So Kessler's not joining the other two in excusing Warren. But he's in on the movement to brand Trump as wrong even when Trump is right. Taylor Swift's Candidates Lag in Polls--PolitiFact Hardest Hit? We noted pop star Taylor Swift's election endorsement statement drew the selective attention of the fact checkers left-leaning bloggers at PolitiFact. We've found it hilarious over the past several days that PolitiFact has mercilessly pimped its Swiftian fact check repeatedly on Twitter and Facebook. Now with polls showing Swift's candidates badly trailing the Republican counterparts we can only wonder: Is PolitiFact the entity hardest hit by Swift's failure (so far) to make a critical difference in putting the Democrats over the top? The Swift claim PolitiFact chose to check was the allegation that Tennessee Republican Marsha Blackburn voted against the Violence Against Women Act. We noted that PolitiFact's choice of topic, given the fact that Swift made at least four claims that might interest a fact checker, was likely the best choice from the liberal point of view. Coincidentally(? ), PolitiFact pulled the trigger on that choice. But as we pointed out in our earlier post, PolitiFact still ended up putting its finger on the scales to help its Democratic Party allies. It's true Blackburn voted against reauthorizing the Violence Against Women Act (PolitiFact ruled it "Mostly True"). But it's also true that Blackburn voted to reauthorize the Violence Against Women Act. Not quite. VAWA came up for reauthorization in 2012.Blackburn co-sponsored a VAWA reauthorization bill and voted in favor. It passed the House with most Democrats voting in opposition. Starting the history of VAWA reauthorization in 2013 trims away the bothersome fact that Blackburn voted for VAWA reauthorization in 2012. Keeping that information out of the fact check helps sustain the misleading narrative that Republicans like Blackburn are okay with violence against women. As likely as not that was PolitiFact's purpose. One of the reasons we started out with and stuck with a Blogger blog for so long has to do with Google's past tendency to give priority to its own. It took us very little time to make it to the top of Google's search results for Web surfers using the terms "PolitiFact" and "bias." But we surmise that some time near the 2016 election Google tweaked its algorithms in a way that seriously eroded our traffic. That was good news for PolitiFact, whose fact checking efforts we criticize and Google tries to promote. And perhaps "eroded" isn't the right word. Our traffic pretty much fell off a cliff between the time Trump won election and the time Trump took office. And it coincided with the Google downranking that occurred while the site was enjoying its peak traffic. We've found it interesting over the past couple of years to see how different search engines treated a search for "PolitiFact bias." Today's result from Microsoft's Bing search engine was a pleasant surprise. Our website was the top result and our site was highlighted with an informational window. The search result even calls the site "Official Site." We're humbled. Seriously. What does the same search look like on Google today? "Media Bias Fact Check"? Seriously? A "PolitiFact" information box to the upper right? The hit for our site is No. 7. It's fair to charge that we're not SEO geniuses. But on the other hand we provide excellent content about "PolitiFact" and "bias." We daresay nobody has done it better on a more consistent basis. DuckDuckGo is gaining in popularity. It's a search engine marketing itself based on not tracking users' searches. So we're No. 1 on Bing and DuckDuckGo but No. 7 on Google. It's not that we think Google is deliberately targeting this website. Google has some kind of vision for what it wants to end up high in its rankings and designs its algorithms to reach toward that goal. Sites like this one are "collateral damage" and "disparate impact."